← When life gives you curves, flaunt them! A bar here in southern Spain is very different from a typical British pub. Although layouts may vary, what you will usually find will be a bar counter, with tall seats around, often with a covered tapas display. This will likely be in two parts, one containing meats and tortillas ready to be heated up and served with your drink, the other with cold tapas and salads. Many bars still serve tapas at an inclusive price with the drink, whilst others serve rather more elaborate nibbles which are charged for individually. One of the main differences with a British pub will be the size of drink. Normally if you ask for a beer (una cerveza) it will be in a smaller glass, either a “tubo” which is a tall tumbler or in a glass not dissimilar to a large wine glass. The only time you will see anyone with a “pint” glass, they will usually be a tourist on the coast. You will be just as likely to see people at the bar drinking coffee (un café) or a glass of wine (una copa de vino). Tables away from the bar counter, either inside or outside, are typical café tables with upright chairs, not lounge-type tables and chairs like in British pubs . There is usually a large display of spirit bottles behind the bar and invariably a leg of Serrano ham on a carving frame. You should try this typical Spanish delicacy – it´s delicious! Almost everywhere, customers take all their food and drink and only pay when they are ready to leave. In busy big city bars, the tapas, usually more sophisticated, will each come with a small wooden skewer and, when you have finished, the barman will count the skewers and charge accordingly. I would recommend you to visit as many bars and cafeterías as possible, especially away from the tourist haunts. Look for places full of Spaniards and litter, in the form of till receipts, on the floor signifying that you have found a good spot. Some bars, especially on the coast, offer more seafood, but try different ones and you will inevitably find a handful that will become part of your regular tapas trail. Where´s your favourite Spanish bar? This entry was tagged Andalucía, culture, East of Malaga, Europe, Food, lifestyle, Malaga, Spain, Spanish bars, Tapas. Bookmark the permalink. Great introductipn to the whole concept of tapas bars. Here in Seville, we have 3000 of them apparently! Yum – que delicioso. They all look so good to eat and I’ll bet there are even more good things to it. perfect tapas hopper. ~~~~ : – ) Nice post – thanks …. Yes, you would be the perfect Tapas Trailer, Isadora! It´s a great way to eat, isn´t it? You mentoined “un cafe.” Could you share a bit of info on Spanish coffee and compare it to what is served in other countries? Are coffee shops popular? Sure, I´ll do that …. but I´d rather do that in another post than here in the comment section. there´s too much to tell! oh that would be wonderful!!! Thank you! Ooooh spanish bar!! Beautiful image of the delicious food! There was this once place down the street from the University . They had huge portions! My favorite was the tortilla or the potatoes in the red sauce. Then there was a place called POE that served Caribbean-inspired tapas. My favorite was the spicy coconut chicken. Mmmmm the spicy coconut chicken sounds wonderful! Next time I’m in Spain , it’s a sure thing! I love tapas with a glass of wine, much better than a proper meal. 🙂 Great photos, Marianne. Yes, I think lots of people prefer it that way. I certainly do. Love it – nice to see a bar without a big screen tv advertising football and big english breakfasts – that’s what living in a tourist area does for you! Now I’m hungry…really hungry. The is one cool Spanish Bar! Great images and the word mix. Am feeling peckish already! Absolutely! We have a couple of spanish restaurants near us – Cuban, technically – and they’re yummy! …and do they serve tapas, Richard? Ah yes, the world-renowned little ham roll thingys!! Wow quite an experience. The bars over here are nothing like that! Probably depends on where you go but hey. I like the idea of the tapas on display – in SA you might be lucky to get some peanuts thrown in on the price or maybe some gourmet crisps if you go to the fancier places. Mmmm same as in the UK then. 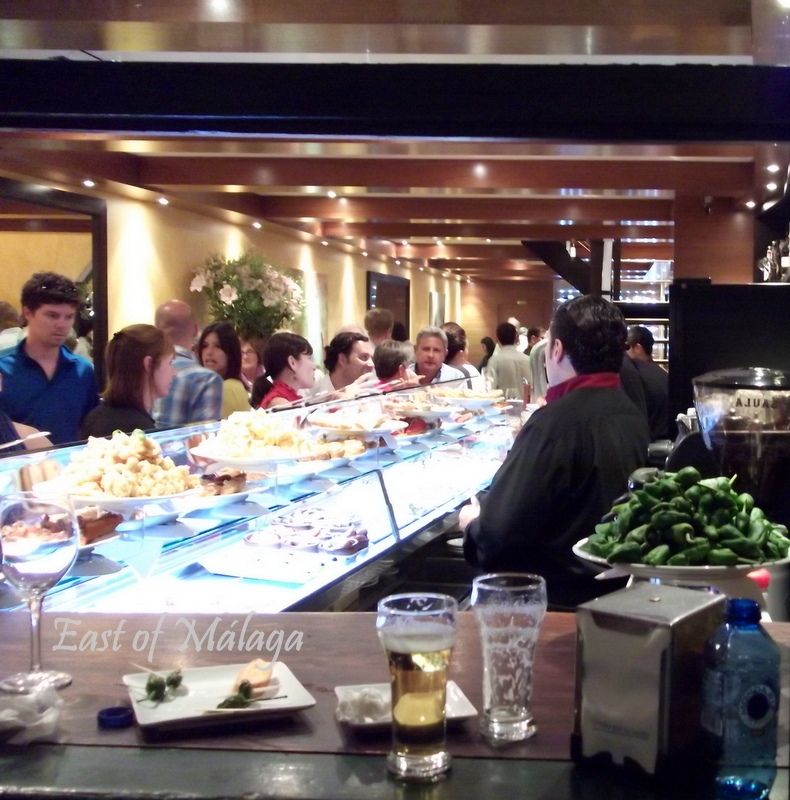 Many bars here offer a free tapa with every drink that you order. In smaller bars you might not get a choice of tapas – you just get what you are given – peanuts, olives or whatever they have made that day. 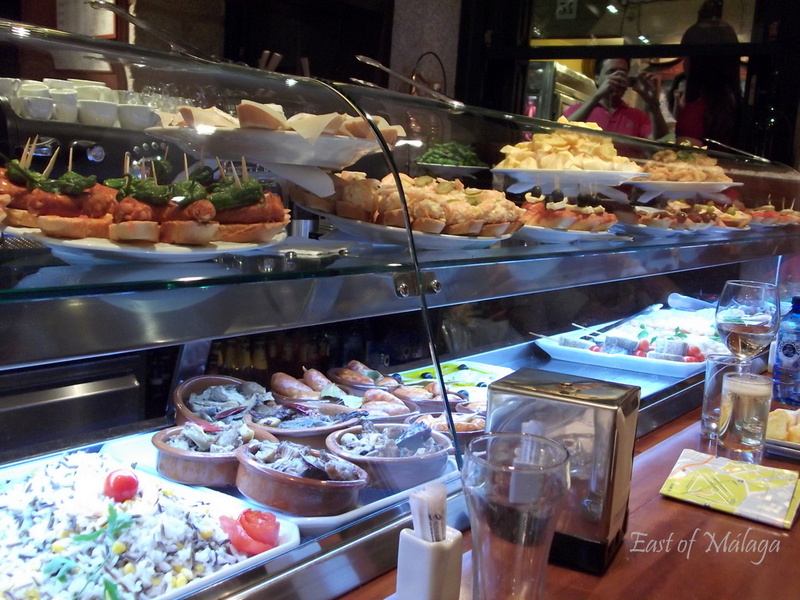 However, in most bars there is the tapas display on the counter and you can choose what you would like to eat. Often the tapas is included in the price (so you could say it´s free). I suppose the drinks cost a few cents more to allow for this, but the thing is, if you chose not to have a tapas, then your drink wouldn´t be any cheaper. I would generally say that the tapas with sticks are normally found in the busier, city bars and are usually charged extra for – but then again, the choice is huge. OH you´re feeling generous, aren´t you? Maybe maybe not – I already have WAY too much buzz today. Add caffeine to the mix and we might have a catastrophe. On the other hand – feels like I’ll get a lot done today. I think you will…..ready to hit the ground, running! Thanks M – you too, a great weekend, too! Yummy images 🙂 Now that’s the way bars should be. I love tapas, or any sharing type meal, and to have a nibble with a glass of wine would be fabulous. The idea of beer in smaller glasses appeals also, I never understand how men can drink a schooner or 5… The sticks also, eating then counting, like at a sushi train is a great idea. Another thing I like, EllaDee, is the honesty of it all. Back in the UK, you have to pay for everything up-front. Here in Spain you order your drinks, and in some bars help yourself to trays of tapas, and when you´ve finished you just present your sticks to the barman to pay. I guess it would be easy to discard some of the sticks you have used, but no-one seems to do that. The system works well, wherever you go. Me too – love eating this way! My absolute favorite way of eating! We were in Barcelona in 2009 and ate in a small simple tapas bar – no tourist in sight. It was great: the waitress was a darling and she poured me a bucket (a huge glass) filled to the brim with red wine. And served smoked almonds on a bed of sea salt. Plus lots of other delicious dishes. It was heaven. Barcelona has some great bars, though most places we have eaten in throughout Spain have been good.